Lakhmir Singh & Manjit Kaur kaur Solutions for Class 10 Science Chapter 1 Electricity are provided here with simple step-by-step explanations. These solutions for Electricity are extremely popular among class 10 students for Science Electricity Solutions come handy for quickly completing your homework and preparing for exams. All questions and answers from the Lakhmir Singh & Manjit Kaur kaur Book of class 10 Science Chapter 1 are provided here for you for free. You will also love the ad-free experience on Meritnation’s Lakhmir Singh & Manjit Kaur kaur Solutions. All Lakhmir Singh & Manjit Kaur kaur Solutions for class 10 Science are prepared by experts and are 100% accurate. The unit joule/coulomb is called by another name, volt. Volt is the SI unit of potential difference. (a) What do the letters p.d. stand for? (b) Which device is used to measure p.d? (a) The acronym p.d. stands for the potential difference between two points in an electric circuit. (b) Potential difference (p.d.) is measured by a device called voltmeter. When we say that the electric potential at a point is 1 volt, it means that 1 joule of work has been done in moving 1 coulomb of positive charge from infinity to that point. The SI unit of potential difference is volt and is denoted by the letter, V.
The amount of charge, Q that flows between two points at a potential difference, V (= 12 V) is 2 C.
The SI unit of electric charge is coulomb and is denoted by the letter, C.
One coulomb is the quantity of electric charge which exerts a force of 9×109N on an equal charge placed at a distance of one metre from it. (a) Potential difference is measured in .......... by using a .......... placed in .......... across a component. (a) Potential difference is measured in volts by using a voltmeter placed in parallel across a component. (b) Copper is a good conductor. Plastic is an insulator. The substances through which electricity can flow are called conductors. Two examples are copper and aluminium. The substances through which electricity cannot flow are called insulators. Two examples are glass and paper. The electric potential (or potential) at a point in an electric field is defined as the work done in moving a unit positive charge from infinity to that point. It is denoted by the symbol, V and its unit is volt. (a) State the relation between potential difference, work done and charge moved. (b) Calculate the work done in moving a charge of 4 coulombs from a point at 220 volts to another point at 230 volts. (a) The potential difference between two points in an electric circuit is equal to the amount of work done in moving a unit charge from one point to another point. (a) Name a device that help to measure the potential difference across a conductor. (b) How much energy is transferred by a 12 V Power supply to each coulomb of charge which it moves around a circuit? (a) The potential difference across a conductor is measured by an instrument called voltmeter. (b) The term 'each coulomb' means 'every 1 coulomb'. Since the work done on each coulomb of charge is 12 J, the energy transferred to each coulomb of charge is also 12 J. (a) What do you understand by the term "potential difference"? (b) What is meant by saying that the potential difference between two points is 1 volt? (c) What is the potential difference between the terminals of a battery if 250 joules of work is required to transfer 20 coulombs of charge from one terminal of battery to the other? (d) What is a voltmeter? How is a voltmeter connected in the circuit to measure the potential different between two points. Explain with the help of a diagram. (e) State whether a voltmeter has a high resistance of a low resistance. Give reason for your answer. (b) The potential difference between two points is said to be one volt if one joule of work is done in moving one coulomb of electric charge from one point to the other. (d) A voltmeter is an instrument that is used to measure the potential difference across a conductor. A voltmeter is always connected in parallel across the points where the potential difference is to be measured. Suppose we have a conductor AB, such as a resistance wire, and we want to measure the potential difference across its ends. So one end of the voltmeter is connected to point A and the other end to the point B. We can read the value of potential difference in volts on the dial of the voltmeter. (e) A voltmeter has a high resistance so that it takes a negligible current from the circuit. 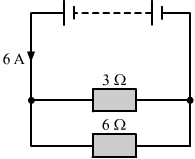 In a circuit, a voltmeter is connected in parallel across the element of whose potential difference it has to measure. Since we don't want the current diverted through the voltmeter, the voltmeter has a high internal resistance so that the circuit maintains the same current as if the voltmeter was not present. The work done in moving a unit charge across two points in an electric circuit is a measure of potential difference. It is connected in parallel across the points where the potential difference is to be measured. It is the SI unit of electric charge. It is the SI unit of potential difference. Since the charge of an electron is 1.6×10-19C, 6.25 × 1018 electrons taken together constitute (6.25 × 1018 × 1.6 × 10−19 C) or 1 coulomb of charge. (a) What is the p.d. at the terminals of the battery? (b) How many joules of electrical energy does 1 C gain on passing through (i) one cell (ii) all three cells? (a) The potential difference across each cell is 2 V. So, the potential difference at the terminals of the battery is 3 x 2 V = 6 V.
So 2 joules and 6 joules of electrical energy is gained for the above two cases (i) one cell and (ii) all three cells, respectively. In a copper atom, the electrons in the outermost orbit are lightly bound to the nucleus of the atom and so they move freely. This free flow of electrons makes copper a good conductor of electricity. In rubber, the electrons in the outermost orbits are tightly bound to the nucleus. So, they do not flow freely and hence, rubber is not a good conductor of electricity. (a) Name a device which helps to maintain potential difference across a conductor (say, a bulb). (b) If a potential difference of 10 V causes a current of 2 A to flow for 1 minute, how much energy is transferred? (a) A cell or a battery helps to maintain potential difference across a conductor. We know that the amount of energy transferred is equal to the work done. Thus, the amount of energy transferred is 1200 J. (a) What is an electric current? What makes an electric current flow in a wire? (b) Define the unit of electric current (or Define ampere). (a) An electric current is the flow of electric charge called electrons in a conductor and its magnitude is the amount of electric charge passing through a given point of the conductor in one second. The potential difference between the ends of the wire makes the current flow through the wire. (b) The SI unit of electric current is ampere. When one coulomb of charge flows through any cross-section of a conductor in one second, the electric current flowing through it is said to be one ampere. An ammeter is an instrument that is used to measure electric current. It is always connected in series with the circuit in which the current is to be measured. Suppose we want to find out the current flowing through a conductor AB. Here, we should connect the ammeter in series with the conductor AB as above. (b) A radio set draws a current of 0.36 A for 15 minutes. Calculate the amount of electric charge that flows through the circuit. Thus, the amount of electric charge that flows through the circuit is 324 C.
(a) an ammeter be very small? (b) a voltmeter be very large? (a) An ammeter should have a very low resistance so that it will not change the value of the current flowing in the circuit. (b) A voltmeter should have a high resistance so that it can take only a negligible amount of current from the circuit. 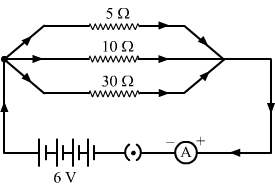 Draw circuit symbols for (a) fixed resistance (b) variable resistance (c) a cell (d) a battery of three cells (e) an open switch (f) a closed switch. What is a circuit diagram? Draw the labelled diagram of an electric circuit comprising of a cell, a resistance, an ammeter, a voltmeter and a closed switch (or closed plug key). Which of the two has a large resistance : an ammeter or a voltmeter? A circuit diagram is a diagram that indicates how different components in a circuit have been connected, using electrical symbols for the components. Here is the diagram of an electric circuit comprising a cell, a resistance, an ammeter, a voltmeter and a closed switch. A voltmeter has a high resistance so that it takes only a negligible amount of current from the circuit. Now, if the charge is 1.6×10-19C, the number of electrons is 1. Thus, 6.25×1018 electrons should pass through a conductor in 1 second to constitute 1 ampere current. (a) a charge of 1 C passes through it? (b) a charge of 5 C passes through it? (c) a current of 2 A flows through it for 10 s? The electric current is the physical quantity that is expressed as coulomb/second since current, I = Q/t. The flow of electric charge in a conductor is called electric current. If a charge of Q coulombs flows through a conductor in time t seconds, the magnitude of electric current is given by, I = Q/t. When we switch on a light, electrons travel through the wires. The flow of these electrons is called electric current. The flow of negatively charged particles (electrons) in a metallic conductor constitutes electric current. (a) In which direction does conventional current flow around a circuit? (b) In which direction do electrons flow? (a) The direction of conventional current is from the positive terminal of a cell or battery to the negative terminal through the outer circuit. (b) The flow of electrons is from the negative terminal to the positive terminal of a cell. Which of the following equation shows the correct relationship between electrical units? Because current, I = Q/t, the correct relationship is 1 A=1 C1 s.
The SI unit of electric current is ampere and is denoted by the letter, A. (a) How many milliamperes as there in 1 ampere? (b) How many microamperes are there in 1 ampere? Ammeter is connected in series with the circuit, whereas voltmeter is connected in parallel across the points where the p.d. is to be measured. The ammeter is connected in series with the circuit in which the current is to be measured, whereas the voltmeter is connected across the points where the potential difference is to be measured. (i) Variable resistance or rheostat. A rheostat is used to change the resistance in a circuit. (ii) A closed switch. When the switch is closed, the circuit is completed and current flows through it. Thus, the electric current flowing through the circuit is 20 A. We know that I = Q/t. Thus, the amount of electric charge that flows through the circuit is 40 coulombs. We know that, I = Q/t. Therefore, the electric current flowing through the circuit is 0.5 A. (a) A current is a flow of ............... .For this to happen there must be a ............... circuit. (b) Current is measured in ............... using an ............... placed in ............... in a circuit. (a) A current is a flow of electrons. For this to happen, there must be a closed circuit. (b) Current is measured in amperes using an ammeter placed in series in a circuit. (a) What is the p.d. across the battery? (b) What current flows from the battery? So the p.d. across the battery is 8 volts. So, a current of 2.5 A flows from the battery. (a) Define electric current. What is the SI unit of electric current. (b) One coulomb of charge flows through any cross-section of a conductor in 1 second. What is the current flowing through the conductor? (c) Which instrument is used to measure electric current? How should it be connected in a circuit? (d) What is the conventional direction of the flow of electric current? How does it differ from the direction of flow electrons? (e) A flash of lighting carries 10 C of charge which flows for 0.01 s. What is the current? If the voltage is 10 MV, what is the energy? (a) Electric current is the flow of electric charges (called electrons) in a conductor such as a metal wire and its magnitude is the amount of electric charge passing through a given point of the conductor in one second. (c) Current is measured by an instrument called ammeter. An ammeter should be connected in series with the circuit in which the current is to be measured. (d) The conventional direction of the flow of electric current is from the positive terminal of a cell or a battery to its negative terminal through the outer circuit, whereas the direction of flow of electrons is from the negative terminal to the positive terminal of a cell. The term voltage came from volt, which is the SI unit of potential difference. An ammeter is connected in series in a circuit and a voltmeter is connected in parallel. The other two statements are incorrect as an ammeter should have a very low resistance and a voltmeter should have a high resistance. It is the SI unit of electric current. Thus, a charge of 50 C is passed in 10 s.
Hence, the correct option is (d) 50 C.
Hence, the correct option is (c) 0.5 A. (a) The lamps are connected in series. (b) The student has connected the ammeter in parallel with the lamps. It should be connected in series. Here is the circuit diagram that shows how three bulbs can be lit from a battery so that two bulbs are controlled by the same switch. The third bulb has its own switch. (a) The magnitude of the electric current is the amount of charge passing through a given point in one second. So, in this case, a charge of eight coulombs flows around the circuit each second. Thus, 1840 joules of energy is transferred to the heater each second. Now, if the charge is 1.6×10-19C, the number of electrons is one. Ohm's law gives the relationship between the current in a conductor and the potential difference across its ends. According to this law, at constant temperature, the current flowing through a conductor is directly proportional to the potential difference across its ends. The SI unit of electrical resistance is ohm and its symbol is Ω. Electrical resistance is the physical quantity whose SI unit is ohm. Objects that have infinitely high electrical resistance are called insulators. An insulator does not allow electricity to flow through it. Now, according to the question, the resistance is constant and the potential difference is halved. It is clear from the above statement that the current becomes half. A thick wire has a greater area of cross-section, whereas a thin wire has a smaller area of cross-section. Also, the resistance of a conductor is inversely proportional to its area of cross-section. This means that a thick wire has lesser resistance than a thin wire. Now, according to the question, the resistance of the circuit is halved and the potential difference is constant. It is clear from the above statement that the current becomes double. Thus, the current flowing in the circuit is 4 A.
Ohm's law state a relation between potential difference and current. (a) Why do electricians wear rubber hand gloves while working with electricity? (b) What p.d. is needed to send a current of 6 A through an electrical appliance having a resistance of 40 Ω? (a) Electricians wear rubber hand gloves while working with electricity because rubber is an insulator and it will prevent them from getting electric shock, in case of short circuit or overloading. So 240 V is the potential difference needed to send a current of 6 A through an electrical appliance that has a resistance of 40 Ω. What would be the values of VI rations when the potential difference is 0.8 V, 1.2 V and 1.6 V respectively? (ii) When potential difference = 0.8 V, current = 0.32 A. When potential difference = 1.2 V, current = 0.48 A. When potential difference = 1.6 V, current = 0.64 A. The V-I graph is a straight line with a constant slope of 2.5. (iii) The resistance of the wire is 2.5 Ω. (a) What is the ratio of potential difference and current known as? 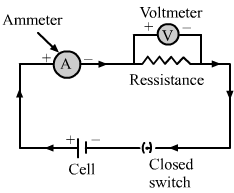 (c) Name the law which is illustrated by the above V−I graph. (d) Write down the formula which states the relation between potential difference, current and resistance. (e) The potential difference between the terminals of an electric iron is 240 V and the current is 5.0 A. What is the resistance of the electric iron? (a) The ratio of potential difference and current is known as resistance R.
(c) Ohm's law is illustrated by the above V−I graph. (e) The potential difference between the terminals of an electric iron is 240 V and the current is 5.0 A. Thus, the resistance of the electric iron will be 48 Ω. If the p.d. across a 3 Ω resistor is 6 V, the current flowing in the resistor will be 2 A as current (I) is given by the equation, I = V (Voltage) / R (Resistance). Thus, if a car's headlight bulb working on a 12 V car battery draws a current of 0.5 A, the resistance of the light bulb will be 24 Ω. Thus, if an electrical appliance has a resistance of 25 Ω and when that electrical appliance is connected to a 230 V supply line, the current passing through it will be 9.2 A. The number of coulombs passing through the resistor is the current passing through it. Thus, when a 4 Ω resistor is connected across the terminals of a 12 V battery, the number of coulombs passing through the resistor per second will be 3. According to Ohm's law, the current (I) flowing through a wire is directly proportional to the potential difference (V) across it, provided its temperature remains the same. Here R is the resistance. The unit of resistance is ohm (â„¦). One ohm (â„¦) is the resistance of a conductor when a potential difference of one volt is applied to its ends and a current of one ampere flows through it. (a) What is meant by the "resistance of a conductor" ? Write the relation between resistance, potential difference and current. (b) When a 12 V battery is connected across an unknown resistor, there is a current of 2.5 mA in the circuit. Calculate the value of the resistance of the resistor. (a) Resistance is the property of a conductor to resist the flow of charge through it. The relation between resistance, current and potential difference is V = IR. (a) Define the unit of resistance (or Define the unit "ohm"). (b) What happens to the resistance as the conductor is made thinner? (c) Keeping the potential difference constant, the resistance of a circuit is doubled. By how much does the current change? ​(a) One ohm (Ω) is the resistance of a conductor when a potential difference of one volt is applied to its ends and a current of one ampere flows through it. So, when the conductor is made thinner, its area of cross-section will decrease, since resistance is inversely proportional to the area of the conductor. Therefore, its resistance will increase. If V is constant, resistance is doubled R' = 2R. Thus, the current will get reduced to half. Ohm's law gives the relationship between current and potential difference. The unit of electrical resistance is ohm. A substance having infinitely high electrical resistance is called an insulator. If the voltage is constant, the resistance is doubled and the current becomes half. If the voltage is constant, the resistance of the circuit is halved. That is, it becomes R / 2. Thus by keeping the p.d. constant, the resistance of a circuit is halved and the current is doubled. An electric room heater draws a current of 2.4 A from the 120 V supply line. The resistance will remain constant unless the room heater is changed. So the room heater will draw a 4.8 A current when connected to the 240 V supply line. The resistance of a conductor depends on its length. It is directly proportional to the length, R α L.
The resistance of a conductor is inversely proportional to its area of cross-section, i.e. R α 1 / A. Resistance depends on the nature of the material of the conductor. Resistance also depends on the temperature of the conductor. (a) Which law is illustrated by such a graph? (b) What should remain constant in a statement of this law? (a) Ohm's law states that the graph between V and I for a conductor is a straight line passing through the origin. (b) Ohm's law is true only if the temperature of the conductor is constant. A potential difference of 10 V is needed to make a current of 0.02 A flow through a wire. The resistance will remain the same unless the wire is changed. So a potential difference of 125 V is needed to make a current of 250 mA flow through the wire. A current of 200 mA flows through a 4 kΩ resistor. So the potential difference across the resistor will be 800 V.
The resistance of a conductor is inversely proportional to its area of cross-section, i.e.R α 1 / A. So when the conductor is made thicker, its resistance decreases. We know that the resistance of the wire, R = ρl / A where the resistivity of the wire is ρ. So when the length of the wire is doubled (l' = 2l) by taking more of the same wire, (it will keep the resistivity and the area of cross-section the same), the length is doubled. Iron is a better conductor of electricity than mercury because the resistivity of iron is less than that of mercury. Why are copper and aluminium wires usually used for electricity transmission? Copper and aluminium wires are used for electrical transmission because they have a low resistance, which makes them good conductors of electricity. The coils of the heating element of an electric iron is made of alloys like nichrome because alloys have a high resistance and a high melting point. Nichrome is an alloy of nickel, chromium, manganese and iron. It is used to make the heating elements of electrical appliances because it has a high resistance and a high melting point. Nichrome is used to make the heating elements of electrical appliances because it has a high resistance and a high melting point. The coils of the heating elements of electric irons and electric toasters are made of alloys like nichrome rather than a pure metal because alloys have a high resistance and a high melting point. (a) a long piece of nichrome wire or a short one? (b) a thick piece of nichrome wire or a thin piece? (a) A long piece of nichrome wire has more resistance because the resistance of a conductor is directly proportional to its length, R α l.
(b) A thin piece of nichrome wire has more resistance because the resistance of a conductor is inversely proportional to its area of cross-section, i.e. R α 1 / A. The lesser the area of cross-section, the more the resistance. (a) How does the resistance of a pure metal change if its temperature decreases? (b) How does the presence of impurities in a metal affect its resistance? (a) The resistance of all pure metals increases on raising the temperature and decreases on lowering the temperature. Therefore, the resistance of a pure metal will decrease on decreasing the temperature. (b) The presence of impurities in a metal increases its resistivity (also resistance) and it does not undergo oxidation easily even at a high temperature. Resistance is measured in ohm (Ω). The resistance of a wire increases as the length increases; as the temperature increases; and as the cross-sectional area decreases. (a) What do you understand by the "resistivity" of a substance? (b) A wire is 1.0 m long, 0.2 mm in diameter and has a resistance of 10 Ω. Calculate the resistivity of its material? When the area of cross-section, A is 1 m2 and the length of the wire, l is 1 m, resistance is equal to resistivity. Resistivity may be defined as the resistance offered by a conductor of length 1 m and area of cross-section 1 m2. Thus, the resistivity of the material, ρ=3.14×10-7 Ω mâ€‹. (a) Write down an expression for the resistance of a metallic wire in terms of the resistivity. (b) What will be the resistance of a metal wire of length 2 metres and area of cross-section 1.55 × 10−6 m2 if the resistivity of the metal be 2.8 × 10−8 Ω m? (a) Give two examples of substances which are good conductors of electricity. Why do you think they are good conductors of electricity? (b) Calculate the resistance of a copper wire 1.0 km long and 0.50 mm diameter if the resistivity of copper is 1.7 × 10−8 Ω m.
(a) Copper and aluminium are good conductors of electricity because their resistivity is very low. Resistivity of the aluminium cable wire = 1.7 × 10−8 Ω m.
Will current flow more easily through a thick wire or a thin wire of the same material when connected to the same source? Give reason for your answer. The resistance of a conductor is inversely proportional to its area of cross-section, i.e. R α 1 / A. So as the conductor is a thick wire, its resistance decreases and current will flow easily through it, in comparison with a thin wire. (a) length of the conductor? (b) area of cross-section of the conductor? (c) temperature of the conductor? The resistance also depends on the temperature of the conductor. It increases on raising the temperature and decreases on lowering the temperature. (a) Give one example to show how the resistance depends on the nature of material of the conductor. (b) Calculate the resistance of an aluminium cable of length 10 km and diameter 2.0 mm if the resistivity of aluminium is 27 × 10−8 Ωm. (a) If we take two similar wires with equal length and diameter, one made of copper (metal) and the other made of nichrome (alloy), we will find that the resistance of the nichrome wire is about 60 times more than that of the copper wire. This shows that the resistance of a conductor depends on the nature of the material of the conductor. Resistivity of the aluminium cable wire = 27 × 10−8 Ω m.
Let the resistance of the aluminium cable be R.
(a) The resistance of a conductor depends on its length. It is directly proportional to the length, R α l. So on increasing the length of the wire, its resistance will increase. (b) The resistance of a conductor is inversely proportional to its area of cross-section, i.e. R α 1 / A. So on increasing its diameter, its resistance will decrease. (c) Resistance also depends on the temperature of the conductor. So on increasing its temperature, its resistance will also increase. (a)The resistance of a conductor is inversely proportional to its area of cross-section, i.e. R α 1 / A. So on increasing the area of cross-section, its resistance will decrease. (b) We know that the area of cross-section, A = πr2 = π (d / 2)2, where r is the radius and d is the diameter of the wire. So on increasing the diameter of the wire, its resistance decreases. (a) Define resistivity. Write an expression for the resistivity of a substance. Give the meaning of each symbol which occurs in it. (b) State the SI unit of resistivity. (c) Distinguish between resistance and resistivity. (d) Name two factors on which the resistivity of a substance depends and two factors on which it does not depend. (e) The resistance of a metal wire of length 1 m is 26 Ω at 20°C. If the diameter of the wire is 0.3 mm, what will be the resistivity of the metal at that temperature? When the area of cross-section, A = 1 m2 and the length of the wire, l = 1 m, ρ=R. Resistivity is the resistance of the conductor whose area of cross-section, A is 1 m2 and length, l is 1 m.
(b) The SI unit of resistivity is Ω m or ohm-metre. 1 ohm-metre is the resistance of a conductor that has a resistance of 1 ohm and whose area of cross-section, A is 1 m2 and length, l is 1 m.
1. It depends on the dimensions of the conductor like radius and length. 2. Resistance of a given material may change at constant temperature. 1. It does not depend on the dimensions of the conductor. 2. Resistivity of a given material does not change at constant temperature. (d) Resistivity of a substance depends on the material and the temperature of the substance. It does not depend on the dimensions of the substance like length, radius etc. Thus, the resistivity of the material is 1.84×10-8 Ω m.
The area of cross-section will increase by four times. Thus, the resistance will get reduced by four times. If the resistance of a certain copper wire is 1 Ω, the resistance of a similar nichrome wire will be about 60 Ω because the resistivity of nichrome is 60 times the resistivity of copper. Area of cross-section will get reduced by four times. Thus, the resistance will increase by four times. The resistivity of a certain material is 0.6 Ωm. The material is most likely to be a semiconductor because it has moderate resistivity. Thus, the new resistance becomes half of the previous one. The resistivity of copper depends only on temperature. The resistance of a conductor is inversely proportional to its area of cross-section, i.e. R α 1 / A. So, when the area of cross-section of a resistance wire is halved, its resistance will increase by two times. A piece of wire of resistance 20 Ω is drawn out so that its length is increased to twice its original length. Calculate the resistance of the wire in the new situation. Now the length is increased to twice the original length. Then let the new resistance be denoted by R'. Thus, the new resistance will become four times. Which material will you use for making (a) electric wires (b) handle for soldering iron, and (c) solar cells? Give reasons for your choices. (a) electric wires: They are made of conductors. Conductors have a low resistivity and so, we will use material Q. (b) handle for soldering iron: It is made of an insulator. An insulator has a high resistivity and so, we will use material R.
(c) solar cells: They are made of semiconductors. A semiconductor has moderate resistivity and so, we will use material P.
Which material is : (a) good conductor (b) resistor (c) insulator, and (d) semiconductor? (a) Which substance is the best conductor of electricity? Why? (b) Which one is a better conductor : A or C? Why? (c) Which substance would you advice to be used for making heating elements of electric iron? Why? (d) Which two substances should be used for making electric wires? Why? (a) E is the best conductor of electricity because its resistivity is the least among the given values. (b) C is a better conductor than A because its resistivity is less than that of A. (c) B should be used for making heating elements of electric iron because its resistivity is the highest among the given values. (d) E and C should be used for making electric wires because their resistivity is less. (i) its length is tripled? (ii) its diameter is tripled? (iii) its material is changed to one whose resistivity is three times? Thus, the resistance will become three times the original resistance. Thus, the area of cross-section will become nine times. Thus, the resistance will be reduced by nine times. Resistivity of the material of the wire = 1.84 × 10−6 Ωm. In a series combination, the same current flows through each resistor. Let the supplied voltage, V be divided as V1, V2 and V3 in resistors R1, R2 and R3, respectively. Thus, in the case of a series combination, the total resistance, R is the sum of the individual resistance R1, R2 and R3. If five resistors, each of value 0.2 Ω, are connected in series, the resultant resistance will be the sum of the individual resistances. In a parallel combination, the voltage remains the same across each resistor but the current gets divided. Let I1, I2 and I3 be the current across resistors R1, R2 and R3, respectively. So, the total resistance is the sum of the reciprocal of the individual resistances. If 3 resistances of 3 ohm each are connected in parallel, what will be their total resistance? The total resistance of the parallel combination is 1 Ω. The two resistors of 2 Ω each should be connected in parallel combination to produce equivalent resistance of 1 Ω. Thus, we will get an 8 Ω resistor. Thus, we will get a 1.5 Ω resistor. 1R=1R1+1R21R=14+141R=241R=12R=2 ΩThus we get a 2 Ω resistor.We should connect two 4 Ω in parallel to get a resistance of 2 Ω. We should connect two 4 Ω resistors in parallel to get a resistance of 8 Ω. In figure B, the resistors of 10 Ω and 1000 Ω are connected in parallel combination. So, the arrangement B has lower resistance. A wire that has a resistance, R is cut into two equal pieces. The resistance of the each piece will be R2. The two parts, each of resistance, R2 are joined in parallel. Thus, the resistance of the combination will be R/4. Let the total resistance of the combination shown in the diagram below be R.
Thus, the total resistance of the combination is 1500 Ω. In the circuit diagram shown above, two 2 â„¦ resistors are connected in parallel combination. Thus the total resistance of the combination is 1 Ω. In the circuit diagram shown above, two 4 â„¦ resistors are connected in parallel combination. Thus, the total resistance of the combination is 5 â„¦. The series resistance is given by R = R1 + R2 + R3 + R4. Hence, it is more than the individual resistance. 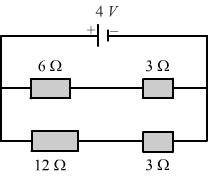 The parallel resistance is given by 1 / R = 1 / R1 + 1 / R2 + 1 / R3 + 1 / R4. Hence, it is less than the individual resistance. The current flowing through this series combination is given by I = V / R.
Now since the resistors are connected in series, the current flowing through each resistance is the same. Hence, the current through the 12 Ω resistor is equal to 0.67 A. In a series combination, the current remains the same. So the current through the 6 Ω resistor is 0.44 A. (a) For the minimum current flowing in the circuit, the resistors should be connected in series and for the maximum current in the circuit, the resistors should be connected in parallel with the battery. This resistance is in series with the resistor, R1. The current flowing through the 4 Ω resistor, I = V/R. The current flowing through the 10 Ω resistor, I = V/R. Suppose x resistors should be connected in parallel to draw a current of 5 A. Hence, four resistors of 176 Ω each should be connected in parallel to draw a current of 5 A from a 220 V supply line. I(a) Let I1, I2 and I3 be the current flowing through the resistors of 5 Ω, 100 Ω and 30 Ω, respectively. (a) The resistors of 2 Ω and 3 Ω are connected in series. (a) With the help of a circuit diagram, deduce the equivalent resistance of two resistances connected in series. (i) What is the current through the 5 ohm resistance? (ii) What is the current through R? (iii) What is the value of R? (iv) What is the value of V? (a) Let the current in the circuit be I amperes and the battery be of strength V volts. Let the combined resistance of the three resistors be R ohms. We know that when resistors are connected in series, the current is the same in all the resistors but the voltage is different across each resistor. (ii) In a series arrangement, the current remains the same across each resistance. Therefore, the current through R also will be 2 A. (a) With the help of a diagram, derive the formula for the resultant resistance of three resistors connected in series. (i) the value of current through each resistor. (ii) the total current in the circuit. (iii) the total effective resistance of the circuit. Let the current in the circuit be I amperes and the battery be of strength V volts. Similarly, the potential difference across the second 20 Ω resistor is equal to 2.5 V.
(a) The resistors are connected in parallel. (b) In a parallel arrangement, the voltage remains the same across each resistor. The battery is also connected in parallel with the resistors. Therefore, the p.d across each resistor is 6 V.
(c) The 2 Ω resistor will have the bigger share of the current since resistance is inversely proportional to the current. The voltage across the whole cicuit,as in case of parallel circuit volatge is same scross all resistances. We know that when resistors are connected in parallel, the potential drop across each resistance is the same. (a) Explain with the help of a labelled circuit diagram, how you will find the resistance of a combination of three resistors of resistances R1, R2 and R3 joined in parallel. 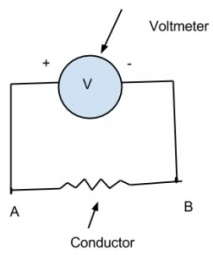 (b) In the diagram shown below, the cell and the ammeter both have negligible resistance. The resistor are identical. We know that when the resistors are connected in parallel, the potential drop across each resistance is the same. The resistors of 6 Î and 2 Î are connected in parallel. This arrangement is further connected in series with the 6 Î resistor. This 40 Î is connected in parallel with the 40 Î resistor. The two resistors of 6 Î are connected in parallel with each other. So, their net resistance 3 Î is connected in series with a resistance of 6 Î. So, the net resistance of the complete arrangement is 9 Ω. This is so because Y alone will offer less resistance. Which one of the columns (a) to (d) shows the correct values of V1, V2 and V3 measured in volts? Because V = IR, the net voltage can be obtained by multiplying current with resistance. If the resistance wire is cut into five pieces, the resistance of each wire is R/5. If we connect the pieces in parallel, we will get the net resistance as R/25. Therefore, the ratio will be 25. Let the resistances of the two resistors be x and y. On solving equations (1) and (2), we will obtain the values of the two resistors as 3 Ω and 6 Ω. This 3 Î is connected in parallel with another 3 Î resistance. To get the resistance of 2.5 Î, we will have to connect the resistors of values 2 Î and 3 Î in series and this arrangement should be connected in parallel with the resistor of value 5 Î. How will you connect three resistors of resistances 2 Ω, 3 Ω, and 6 Ω to obtain a total resistance of (a) 4 Ω, and (b) 1 Ω? (a) To obtain a 4 Ω resistance, connect the 2 Ω resistor in series with the parallel combination of the resistors of values 6 Ω and 3 Ω. (b) To obtain a 1 Ω resistance, connect all the resistors in parallel. What is (a) highest, and (b) lowest, resistance which can be obtained by combining four resistors having the following resistances? (a) To get the highest resistance, all the resistors must be connected in series. Therefore, the highest resistance is 48 Ω. (b) To get the lowest resistance, all the resistors must be connected in parallel. Therefore, the lowest resistance of the arrangement is 2 Ω. What is the resistance between A and B in the figure given below? The largest value of resistance is obtained when the resistors are connected in series. Therefore, the largest resistance is 100 Ω. The lowest resistance is obtained when all the resistors are connected in parallel. Therefore, the lowest resistance of the combination is 0.01 Ω. When two 100 Ω resistors are connected in parallel, the value of the combined resistance becomes 50 Ω. Now to get a resistance of 250 Ω, we must connect two more 100 Ω resistors in series with the above combination. Therefore, the configuration will be two 100 Ω resistors in series with a parallel combination of another two 100 Ω resistors. The p.d across all the resistors R1, R2, R3 and R4 is 12 V.
Since all the resistors are of the same value, the p.d at exactly half of the combination, i.e. the voltage shown by the voltmeter C will be 6 V. Similarly, the p.d. shown by the voltmeters A and B is one-fourth the p.d. across all the resistors. Therefore, A and B will have a reading of 3 V.
The effective resistance of combination is 4 Î. Since the lamps are the same as given in the question, the resistance of both the lamps will be the same. Therefore, the current is distributed equally. Since the combination shows a 0.50 A current in the circuit by the ammeter A1, the current shown by A2, A3, A4 and A5 will be the same and equal to 0.25 A. No, the lights in the house are wired in parallel. When a bulb in a series circuit blows off, the power supply to all other bulbs is cut off. Hence, all the other bulbs are switched off. When one of the bulbs in a parallel circuit blows off, it does not affect the other bulbs. (a) Series circuit: This is so because in a series circuit, a large number of low-power decorating bulbs can be used effectively. (b) Parallel circuit: This is so because in a parallel circuit, if one bulb does not work properly, it does not affect the working of the other bulbs. A series arrangement is not used for connecting domestic electrical appliances because different appliances have different resistances; this leads to the problem of unequal voltage distribution. Another reason why this arrangement is not preferred is that if one of the appliances gets damaged, the power supply to all other appliances is cut off. (a) A parallel circuit has a low resistance. (b) It prevents unequal power supply as opposed to a series circuit. (c) If one device in the series is damaged, it does not affect the other devices. (a) The parallel circuit will have the highest voltage across each bulb. (a) The lamps will be the dimmest in the series circuit (ii) because the voltage will be divided between the two lamps. (b) In circuit (iii), the lamps will be as bright as in circuit (i) because circuit (iii) is a parallel arrangement. In a parallel arrangement, the voltage remains the same. (c) Circuit (iii) will give the maximum light as circuit (iii) has a parallel arrangement. A parallel arrangement offers less resistance and thus circuit (iii) will give more light. (a) Which is the better way to connect lights and other electrical appliances in domestic wiring: series circuits or parallel circuits? why? (b) Christmas tree lamps are usually wired in series. What happens if one lamps breaks? (c) An electrician has wired a house in such a way that if a lamp gets fused in one room of the house, all the lamps in other rooms of the house stop working. What is the defect in the wiring? (d) Draw a circuit diagram showing two electric lamps connected in parallel together with a cell and a switch that works both lamps. Mark an â’¶ on your diagram to show where an ammeter should be placed to measure the current. (a) A parallel arrangement will be a better way to connect lights and other electrical appliances in domestic wiring because a parallel arrangement has a low resistance. Also in case of any short circuiting in one appliance, the other electrical appliances remain unaffected. (b) In a series arrangement, if a lamp blows off, the power supply to the other lamps is cut off. Hence, all the lamps will get switched off. (c) The electrician has wired the house in a series circuit. (b) If one lamp fails, the others remain lit. This is so because in a parallel circuit, if one device fails, it does not affect the working of the other devices. (c) With S2 open and S1 closed, A and B are lit. This is so because if the switch, S2 is open, the current will flow through lamp A because it is a parallel circuit. (a) Draw a circuit diagram showing two lamps, one cell and a switch connected in series. (b) How can you change the brightness of the lamp? (b) The brightness of the lamp can be changed by connecting the lamps in parallel. (a) The brightness of A and B is the same. C is brighter since in A and B, the same amount of current flows but the voltage gets divided into two parts. Therefore, bulbs A and B glow dimmer. (b) The brightness of A will remain the same because voltage distribution will have no effect if bulb C burns out. (c) Bulb A will get switched off because the current will not flow to it if bulb B burns out since they are in a series circuit. The brightness of C will remain the same because the same current will continuously flow through bulb C.
The brightness of two lamps arranged in parallel will be more compared with the brightness of two lamps arranged in series because a parallel circuit offers less resistance. In a parallel circuit, if the filament of one lamp breaks, it will have no effect on the other lamp. If the same happens in a series circuit, the other lamp will stop glowing. This is because in a series circuit, if one of the bulbs blows off, the circuit is broken and the power supply to the other bulb is cut off. If you were going to connect two light bulbs to one battery, would you use a series or a parallel arrangement? Why? Which arrangement takes more current form the battery? A parallel arrangement will be preferred in this case because a parallel arrangement has less resistance than a series arrangement. Also, in case of any short circuiting, the other bulb remains unaffected. A series arrangement will draw more current from the battery. The switch is turned to the right for brighter light and is turned to the left for dimmer light. This happens because when the switch is turned to the right, it offers less resistance and when turned to the left, it offers more resistance. A 60-watt bulb has a higher electrical resistance than a 100-watt bulb. Because power is inversely proportional to resistance, when the power is less, the resistance is high. The commercial unit of electric energy is kilowatt hour or KWh in short. (i) The SI unit of electric energy is joule. (ii) The SI unit of electric power is watt. (i) Kilowatt is the unit of power. (ii) Kilowatt-hour is the unit of energy. The symbol KWh stands for kilowatt-hour. It is the commercial unit of electrical energy. We know that power and potential difference are related to each other as given in the equation P = V2/R. Now, keeping R the same, if V is doubled, power gets increased by four times. The label further tells us that the total power consumed by the electric lamp will be 36 W and the current derived by it is 3 A (using the equation, P = VI). What current will e taken by a 920 W appliance if the supply voltage is 230 V? We know that power is given by P = VI, where I is the current consumed by the device. Thus, the current consumed by the appliance is 4 A. One watt-hour is the amount of electrical energy consumed when an electrical appliance of power equal to 1 watt is used for 1 hour. Thus, more electrical energy is consumed in case (ii). (a) What is meant by " electric power"? Write the formula for electric power in terms of potential difference and current. (b) The diagram below shows a circuit containing a lamp L, a voltmeter and an ammeter,. The voltmeter reading 3 V and the ammeter reading is 0.5 A. (i) What is the resistance of the lamp? (ii) What is the power of the lamp? (c) Define kilowatt-hour. How many joules are there in one kilowatt-hour? (d) Calculate the cost of operating a heater of 500 W for 20 hours at the rate of Rs 3.90 per unit. (a) Electrical power is the electric work done per unit time. (c) One kilowatt-hour is the amount of electrical energy consumed when an electrical appliance having a power rating of one kilowatt is used for one hour. Watt is the unit of electric power. An electric iron may use a power of 850 watts. Thus, it is clear that the TV set consumes more electrical energy. (i) a 6 V battery in series with 1 Ω and 2 Ω resistors. (i) As the 6 V battery is connected in series, the potential difference will be different across the two given resistors. So we need the current to calculate the power. (ii) As the battery is connected in parallel to the 12 Î and 2 Î resistors, the potential difference across them will be the same. Joule is the SI unit of energy. Kilowatt-hour is the commercial unit of electrical energy. So the cable should be able to carry more current than this and hence the answer is 15 A. This is the maximum power that can be drawn in the house. Since P = V2R, when the potential difference is halved, the power becomes one-fourth. The electric heater will consume more electrical energy when the length of its heating element is reduced because resistance is directly proportional to length (R = ρlA). Hence, resistance will decrease. Power is inversely proportional to resistance (P = V2R). Hence, power will increase. Thus, a decrease in resistance means an increase in the power consumed. (a) The lamp has the greatest electrical resistance because the current drawn by it is the least. R = VI and hence resistance varies inversely with the current. The kettle draws a large amount of current. So the wire may melt down due to heating. For the device to be safe, it needs to be have an earthing system. This is missing here. (d) As current is directly proportional to potential difference, halving the potential will halve the current too. Therefore, the new current value will be 4.25 A. (a) The meter reading on Sunday was 42919. (b) The meter reading on Monday was 42935. (d) These units have been consumed in 24 hours. Let x be the number of 10 W bulbs used. Let R be the resistance of the lamp and V be the potential difference applied. (a) Derive the expression for the heat produced due to a current 'I' flowing for a time interval 't' through a resistor 'R' having a potential difference 'V' across its ends. With which name is this relation known? (b) How much heat will an instrument of 12 W produce in one minute if it is connected to the heat produced by it? (c) The current passing through a room heater has been halved. What will happen to the heat produced by it? (d) What is meant by the heating effect of current? Give two applications of the heating effect of current. (e) Name the material which is used for making the filaments of an electric bulb. (c) The heat produced by the room heater will become one-fourth the previous quantity when the current passing through it is halved because the heat produced is directly proportional to the square of the current. (d) When an electric current is passed through a high resistance wire, like nichrome wire, the resistance wire becomes very hot and produces heat. This is called the heating effect of current. The heating effect of current is used in electric irons, electric heaters, electric ovens, filament bulbs etc. and it is also utilised in electric fuses. (e) Tungsten is used for making the filament of an electric bulb. It shows that the heat produced is proportional to the square of the current. Heat produced by a current passing through a wire with a fixed resistance depends on the square of current, I. If the current passing through a conductor is doubled, what will be the change in heat produced? If the current passing through a conductor is doubled, the heat produced will increase by four times because the heat produced is directly proportional to the square of the current. The heating effect of current is utilised in an electric bulb. The heating effect of current is utilised in the working of an electric fuse. The two devices that work on the heating effect of electric current are a bulb and an electric fuse. Filament type of electric bulbs are not power efficient because a lot of power gets wasted as heat. It is so because the connecting cord has a very low resistance. So, it does not get enough heat to glow. (a) Write down the formula for the heat produced when a current I is passed through a resistor R for time t.
(b) An electric iron of resistance 20 ohms draws a current of 5 amperes. Calculate the heat produced in 30 seconds. (a) H = I2Rt where H is the heat energy produced, I is the current, R is the resistance and t is the time. (a) State and explain Joule's law of heating. (b) A resistance of 40 ohms and one of 60 ohms are arranged in series across 220 volt supply. Find the heat in joules produced by this combination of resistances in half a minute. If air is filled in an electric bulb, the extremely hot tungsten filament would burn up quickly because of the oxygen present in the air. So, a bulb is filled with a chemically unreactive gas like argon or nitrogen. Tungsten is used for making the filaments of electric bulbs because it has a very high melting point (3380°C). It does not melt down and thus remains white hot. The current that makes the heater element very hot, only slightly warms the connecting wires leading to the heater because the connecting wires have a low resistance. So they do not get hot. But the heater element has a very high resistance and so it gets very hot. (a) the power of the resistor. (b) the voltage across the resistor. Heat produced is directly proportional to the square of the current. An electric fuse works on the heating effect of current. Nichrome has a high resistance. This is so because in this case, the resistance of the wire will be low. This is so because of the heat produced when a filament type light bulb glows. It is the temperature of an electric bulb filament when it glows. This is so because heat produced is directly proportional to the square of the current passing through the resistor. (a) Material S will be used for making the heating element of an electric iron as it has a high resistivity . (b) Material Q will be used for making the connecting wires of an electric iron as it has a low resistivity. (c) Material R will be used for making the covering of the connecting wires as it has an extremely high resistivity. (a) How does the wire in the filament of a light bulb behave differently to the other wires in the circuit when the current flows? (b) What property of the filament wire accounts for this difference? The wire in the filament of a light bulb has a high resistance and a high melting point. So, it heats up without melting and glows when the current flows through it. The connecting wire in a circuit has a low resistance and a low melting point. So, it does not heat up much when the current flows through it and thus does not glow. (b) It is the high melting point of the filament wire that is accountable for this difference. Let the resistance be R.
It is clear that the net resistance is more in the series combination. Therefore, more heat will be obtained in a series connection, as the heat produced is directly proportional to the resistance in the circuit. where the symbols used have their usual meanings.